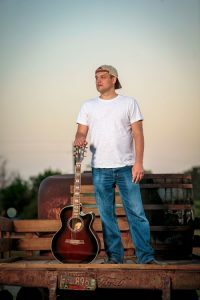 Rusty Laffoon brings a soulful edge to the ever expanding genre of country music. With a heartfelt passion in his vocals, he will draw you in to each song and story. You will think like you are playing your own part in it. Many of his fans find comfort in the fact that they can call him a friend. They feel a strong connection to hi as a person. Rusty grew up outside the city limits of the small town, Basehor, KS. He was surrounded by musicians in his family including his father, uncle, and aunts. He quickly found music to be a passion of his own. There was never just one genre on the music shelf in the Laffoon household. That is still reflected today in Rusty’s song list. Growing up this mix of genre’s never changed, as the CD compilations in Rusty’s beater cars often included unusual mixes including Garth Brooks, Otis Redding, George Strait, B.B. King, and Guns and Roses. Rusty started performing in 1998 by sitting in on lead vocals with his uncle, Dennis Laffoon, and he soon formed the band Spent with his father, Dallas, and the band was often a family affair including Rusty’s brothers and uncle. In 2006, Rusty joined the band Pastense as their lead vocalist and also met his good friends and future band mates, John Sanders and Stan Hampton. In 2007, Rusty, John, and Stan brought Marc Hudson aboard on drums and formed The Radio Flyers. For nearly 8 years, The Radio Flyers, played across Kansas City, and became known for their diverse sets covering rock, country, and Motown flavors. Sadly, in September of 2013, Stan was diagnosed with Cancer. After a long and brave fight he lost his battle in April of 2015. After celebrating the life and grieving the loss of their band brother. Their continued bond has moved them forward as the Broken Wagon Band. This transition also allowed Rusty to get back to the roots of his early vocal influences and find a home in the new diverse country genre.